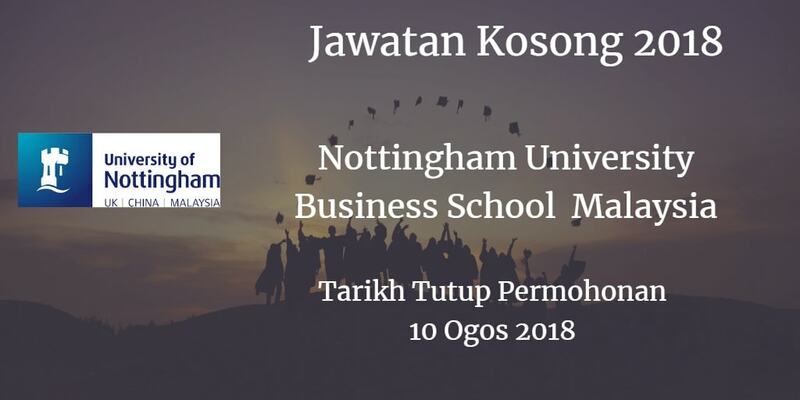 Sukacita dimaklumkan bahawa terdapat pelbagai kekosongan jawatan Nottingham University Business School (NUBS) Malaysia,akademik berikut. Peluang kerjaya di Nottingham University Business School (NUBS) Malaysia . very successful flagship MBA (Association of MBAs (AMBA) accredited). Reflecting on University of Nottingham’s Global Strategy 2020 and Strategic Roadmap 2013-2020 of UNM, the School endeavors to increase the size of academic staff, the proportion of them producing internationally excellent research, and its students; while improving teaching and learning quality, embedding latest developments in curriculum design and taking advantage of investment In Its facilities. NUBS Malaysia is seeking to appoint the Dean to provide visionary leadership to the School. The Dean is a member of the Faculty Management Group of the Faculty of Arts and Social Sciences, and a member of Leadership and Management Forum of the University. The Dean must have a passionate belief in the value of higher education and the pursuit of excellence In both research and teaching. Please visit http://nottingham.edu.my/jobs s to find out more about the role and key responsibilities of this position. The minimum requirements and application process can also be found In the same link. Applications close by 10 August 2018, but earlier ones are welcome.